Arrow Season 3 spoilers ahead! 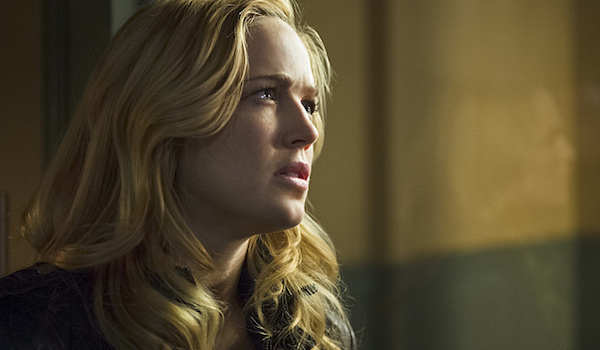 The upcoming The Flash/Arrow spinoff Legends of Tomorrow is already raising a few questions as it relates to its lead characters, one of which involves Sara Lance -- aka Black White Canary -- who was killed off partway through Season 3 of Arrow. We know Sara is going to be back in action for Legends of Tomorrow, but from what Caity Lotz told us at Comic-Con, the kickass character will be back sooner than that, as she's set to return to Arrow Season 4. I’m definitely going to go onto Arrow. I’ll be making appearances and there’s a lot to deal with. Maybe she’ll have a wonderful revenge kill list, and throughout the series I think we can hopefully keep addressing it and in tying those in, because it’s interesting to bring those two shows together, but definitely be coming on Arrow, what they do with that… I think will be interesting. To be clear on the tone of the above quote, Lotz didn't seem entirely certain -- or she was trying not to spill too many beans -- on just what was in store for her character, though the mention of a revenge kill list certainly does sound like an intriguing idea. She does confirm that Sara will be back on Arrow in Season 4. Of the lead characters of Legends of Tomorrow, Lotz's does seem to have the most background to sort out. For one thing, if and when she comes back to life via the Lazarus Pit, she may want to notify her sister Laurel, her father Quentin, and her former love interests Oliver Queen and Nyssa al Ghul. Then there's the matter of Thea, who's the one who technically put the arrows into Sara's chest, sending her over the edge of a building and to her death. And then there's Malcolm Merlyn, who was behind Thea's actions, and more recently inherited the mantle of R'as al Ghul. Yeah, this could get complicated. There's a lot to sort through, and it's possible Arrow will seek to tie up all or most of those loose ends leading into Legends' arrival so that Sara can go into the new series without all of that baggage. But it's just as possible that some things will be held off for the inevitable crossovers. And let's face it, it wouldn't be the first time Quentin Lance wasn't informed that his daughter wasn't as deceased as he thought she was. We're assuming that when Lotz says she'll definitely be back on Arrow, it'll be in the present day part of the show, but it seems necessary to acknowledge that her "return" could be in flashback form, as it's also very possible the necessary set-up for Sara will involve flashbacks to points in her past, which would presumably overlap with Oliver's in some way as he's typically at the center of most flashbacks. But here's hoping we see this Canary back in action in the present day, as it would be great to see how she resolves the mentioned loose ends. While Lotz wasn't able to go into specifics on what Sara will be up to on Arrow, it is evident that we'll see her eventually. And as she points out, both Arrow and The Flash will be helping to set up the Legends characters. One of the things about Flash and Arrow, for the season, is the first half is a lot of it is going to be setting up our show, setting up our characters and bringing them into the world, so that will be interesting. That set-up apparently includes the perplexing situation involving Firestorm, or the half of him that's set to be featured in Legends of Tomorrow. But what of Robbie Amell's character? Find out what Victor Garber had to say about that here. Arrowreturns for Season 4 on Wednesday, October 7 on CW.